When you’re looking for a special personalized gift to show someone you care, choose one of Erie Landmark Company’s commemorative gift plaques. We offer a selection of fun and friendly bronze and aluminum gift plaques to welcome someone to a new home, give as thoughtful gifts to friends or teachers or mark the entrance to a private man cave. At Erie Landmark Company, we began crafting these unique aluminum and bronze novelty plaques for our children to give to teachers as a “thank you” for a great school year or to friends and family for birthdays and holidays. Eventually, we began showing our plaques at trade shows and discovered that many more customers wanted these plaques for their homes, too. 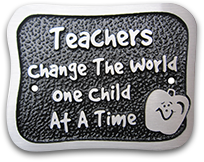 Now we offer a selection of fun, unique gift plaques available in durable bronze and aluminum styles. All of our plaques are crafted using a no-bake sand casting technique that gives the material a pleasant sheen. When deciding to give a friend or family member a gift, you want something they’ll enjoy and that will last. Aluminum and bronze have traditionally been materials of choice for signs and markers because of their attractiveness, durability and resistance to weather and corrosion. 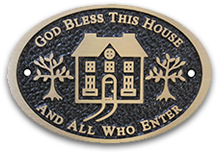 By choosing an elegant and classically designed aluminum or bronze gift plaque, you know it can be incorporated easily into any home’s style, provide a positive impact for family visitors and cherished for many years. At Erie Landmark Company, we want your gift-giving experience to be pleasant, fast and simple. That’s why all of our aluminum and bronze gift plaques are available to order online and can be designed to your specifications in only three easy steps. Once you’ve selected your aluminum or bronze gift plaque, most styles are in stock and you can expect to receive it in just a few days. To give your family, friends and co-workers an unforgettable and thoughtful gift for their home, trust the craftsmanship and stylish aluminum and bronze gift plaques available at Erie Landmark Company — a division of Paul W. Zimmerman Foundries. We’re a family-owned company that prides ourselves on providing fun, high-quality aluminum and bronze products that will last a lifetime. We provide a variety of styles that can be easily incorporated into anyone’s home because of its classic appearance and timeless designs. Choose the perfect bronze gift plaque or aluminum gift plaque for your needs and learn more about our plaque offerings by filling out our online contact form or calling us today at 800-874-7848. Below are our Readymade plaques that you can purchase. Each plaque comes with 2 screws painted to match your background color choice.